Below you will find our answers to the most frequently asked questions that we are receiving about the upcoming iPad initiative. Should you have any questions about the program that we have not addressed here, please free to contact Mr. Klay Shannon, Director of Technology and project leader of Prairie’s iPad program. Mr. Shannon may be reached at [email protected]. Q. Why are we implementing an iPad One-to-One Program at Prairie? A. In the last few years, the spotlight has been bright upon the use of iPads in schools, as a growing number have adopted a “one-to-one” model in their classrooms (i.e., giving one iPad to each child). As of today, there are already an estimated 1.5 million iPads in use in schools across the country. Make use of a wide variety of 3rd party applications (“apps”) that facilitate the learning process. Helpfully, Apple, Inc., has produced a 5-minute video that fully describes and highlights how this exciting new technology and software are being used in schools across the country. We highly recommend that you watch the video and note how significantly iPads and the related software are enhancing student engagement and learning wherever they have been introduced. This video may be found at http://www.apple.com/education/ipad/index.html#video-textbooks. Q. Why are we continuing the One-to-One program? How would the iPad fare as a streamlined method to create and collaborate on documents? Over the first two years of the implementation, things have vastly improved in this area. Students are now able to quickly create, collaborate, and share documents with their teachers and with each other. Starting in the fall of 2014, we will begin using eBackpack in the Middle School, which will make the process of disseminating and collecting material even easier for students and teachers. Until recently, publishers have been slow to transition their textbooks and other print resources to a digital format, but this situation continues to progress. Each year of the iPad implementation we continue to see gains in the quality and availability of digital content in education. As with other forms of media such as music, photography and video, published content continues its trend of migration to the digital format. In short, this is the opportunity that we have been waiting for. With these two key issues resolved, the following capabilities are now at hand. Teachers will also be able to use the new iPad not only as a conduit to their custom digital content, but also as a robust note-taking and supportive technology tool that provides text-to-speech opportunities for those students with reading challenges. This program gives middle- and upper-school students the use of an iPad both inside and outside the classroom, both at school and at home, and for use with school-sanctioned materials as well as content purchased by the family. We are excited about the timing of this initiative. We are poised just ahead of the full conversion from print to digital content. Our timing will give faculty and students a baseline of digital materials to start with, a volume that will grow over time, enabling them to transition smoothly and apace the industry’s full conversion to digital content. Alternatively, the longer we defer, the higher the risk that we would land on the wrong side of this conversion. Q. When will students first receive their iPad? A. We will begin distributing iPads to students new to 5th grade on August 14th, and those new to Prairie in grades 6-12 on August 15th, with a makeup session date of August 18th. If you are new to Prairie or the middle school, you will receive an email outlining the specifics of this training via email. Q. Will there be any training for students on how to use the iPad? A. Yes, the initial orientation session will help students get create the proper accounts on their device, and give them time to learn the basics of iPad navigation. Parents of new 5th graders are REQUIRED to attend the orientation. After that, students will receive instruction on the various apps, processes and procedures within their classes during the first few weeks of school. Q. May students opt out of using the iPad altogether? A. No. We want every student to be on an equal footing in each class as they learn to use the iPads. Q. Can students install their own apps? A. Yes. Once they set up their own personal Apple account, the educational content that is purchased each year will travel with them from year to year, at Prairie and beyond. Q. Can I, as a parent, control what apps my child installs? A. Yes. Parents of younger students (in grades 5 and 6) will be asked to initially be the owner of the personal account, transferring its ownership to the student at a point they are comfortable after they are 13 years old. Parents of children in grades 7-12 will be given the choice to follow the same model, or allow their student to be the owner right from the start. Q. Will I need to create a new Apple account for my child to use with the iPad? A. We really request that students do not share a parent account do to issues with backup. They need to create their own Apple ID, preferably using their school email address. Q. Do I need to tie this account to a credit card? A. No. While there may be some apps/content you wish to purchase on your own, Apple accounts can be stocked with a balance through the use of iTunes gift cards, limiting the amount they could spend. We ask that you do NOT create an account tied to a credit card. Q. Will keyboards be issued as well, or are students expected to use the on-screen keyboard? Will laptops still be available for typing written work? A. While students will be provided with a protective case and a stylus for their iPad, we will not provide external keyboards for each iPad. Our desire is to keep program costs as low as possible. That said, we will continue to provide the same access to school laptops for students whose teachers have assigned work for which laptops are better suited. Q. My child already has an iPad. Will s/he be able to use that one? A. Yes. If your child already has an iPad, he or she can use it in place of purchasing one through the school’s program, given certain provisions and restrictions. 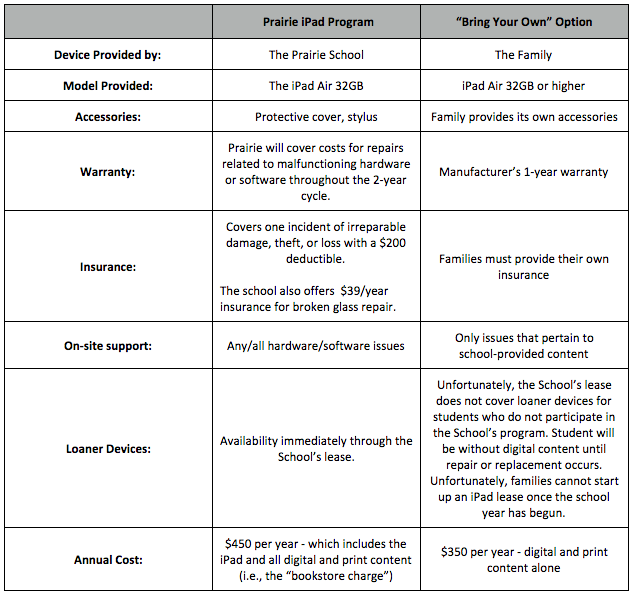 Please see the attached Prairie iPad Leasing PROGRAM vs. Personal iPad Comparison to determine whether this choice is right for your family. Q. Will the Internet be filtered on the student iPads? A. While on campus, the student iPads will be filtered exactly like our current computers are. However, please remember that no Internet filtering is 100% effective, whether or school or at home. The filtering software will, at times, filter sites that it shouldn’t and fail to filter sites that it should. The good news is that, for the most part, the filtering software does help cut down on student browsing of inappropriate Internet sites. One thing to keep in mind is that while the iPads are on campus, the Internet will be filtered. However, when they leave campus and our control, they will no longer be filtered. We strongly recommend the boundaries for appropriate home-use of the iPad are included in your family’s discussions, and clear expectations are laid out for your student as they would for any Internet-accessible device. Q. How will repairs be handled, and what if the iPad is lost, stolen, or damaged beyond repair? A. For those opting to use a school-leased iPad, Prairie will cover costs for repairs related to malfunctioning hardware or software throughout the 2-year cycle. Damage to the device is NOT covered by the school. If there is an incident of theft or irreparable damage, there will be a $200 deductible assessed the family on the first occurrence to replace the device. Full cost of a replacement device will be assessed for any subsequent incidents. Those who choose to use their own iPad will be responsible for any/all repairs and /or replacement. Q. If my child’s iPad has to be sent off for repair, will s/he be at a disadvantage in class? A. No. If there is a problem with an iPad leased through the program, the iPad should be returned to Prairie so that we can send it off for repair. The turn-around time for repairs is usually 3 to 5 days. During this time, we will supply a loaner iPad so that there is no disadvantage to the student. While Prairie will not have an unlimited supply of loaner iPads, we will do our best to see that one is available. For those who choose to use their own iPad, families will need to provide a timely replacement device for their child should there be a time when their iPad is being repaired. Q. Are all textbooks now distributed electronically? A. Not all textbooks are currently available electronically. We continue the process of evaluating our current electronic and paper textbooks each year, transitioning to electronic versions whenever and wherever it is appropriate to do so. We will continue to transition to fully interactive electronic textbooks in a thoughtful manner to make sure our students are using the best learning resources available and not simply transitioning to any e-textbook just because it’s available. Q. I understand that many textbooks may not be available in an electronic version next year. Will we be billed for (paper) books separate from digital content like eBooks and apps? A. No, all textbook-related charges are included in the one flat fee. As we transition from printed materials to digital content, we are now going to a flat bookstore fee model that will include the iPad and all educational content (print and digital), all in one price of $450 a year. If you choose to use your own iPad, there is still an educational content (bookstore) fee of $350. Q. At the end of the two-year lease cycle, can families “buy out” the iPad? A. Yes, families will be given the opportunity to retain their iPad for a price that is comparable to the current resale rate, or else return it to the school by a certain date to be returned to the leasing company. In either, students returning to Prairie the following year will receive a new iPad to start the next 2-year cycle. Q. What happens if my child graduates or leaves Prairie after the first year of the lease? In such a situation, can families choose a “buy-out” option? A. Unfortunately, all students graduating or leaving Prairie in the middle of the 2-year lease cycle would be required to return their iPad to Prairie so that the school can replenish its stock of the current model in use to support the entire student body – and especially for incoming 5th graders and for those students new to Prairie. Q. Won’t the iPad be a distraction to the students in Class? For example, couldn’t students end up playing games in class instead of staying on task? A. This is certainly something that could happen, but it is something that our teachers have already learned how to handle. In any event, when students are engaged in their classes, this behavior rarely occurs. And, clearly, iPads enhance the level of student engagement in the classroom. That said, the ultimate lesson that we will continue to teach is one of personal accountability for one’s actions, as this is one of Prairie’s “7A’s.” Such a lesson is increasingly important to students as they progress through increased levels of privilege and responsibility on the road to adulthood. Q. Will students get to keep their iPads over the summer? A. Yes. If parents wish to hand in their iPads for the summer, arrangements can be made with the Technology Department. We based our planning on the assumption that each student in 5th-12th grades will participate in the School’s program. This assumes that each will receive his or her new iPad from the School next August. While many families already may already have iPads II’s we were informed that Apple plans to change its operating system this summer. Unfortunately, I cannot assure you that the iPad II will work effectively. I ask you to review the program details listed below: It provides the comparison between the “bring your own” option and the advantages of the School’s Apple lease program. If you wish to consider using your own along with the potential questions that will exist, please call Klay Shannon at 262 260 7286. Other wise, we will expect your child(ren) to participate in the School’s program. I ask you to notify the School of your decision by June 1st. As I hope you will see, the School-provided iPad program represents a far more complete package, a bundle of educational benefits, and security for Prairie students. Please remember that your child will have its own School leased iPad 24/7 on a 365-day basis. We hope that you decide to use the Prairie iPad program for your family. This entry was posted in All News, Featured, Middle School, Primary School, Upper School by prairieschool. Bookmark the permalink.